Each year the VetShop Team selects a certain number of charities to support during the year. This year we have again chosen World Vision as our Christmas Charity. Through the World Vision Smiles program, we've donated an entire stable with two donkeys, two cows, two goats, four ducks, and six chickens with chicken feed to a community in Zambia. To reflect our appreciation of the most important people to our business, we made the donation in the name of our staff and our customers. 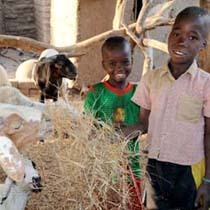 Like in previous years, we've chosen a gift of farm animals as they help to fight poverty on so many levels. Our gift goes towards agriculture and environment work to help communities grow food for families and restore and improve their environments and combines our love of animals with our desire to help the most needy. We know that World Vision place a huge emphasis on animal husbandry so we know the animals we've donated, as well as helping the community, will also be properly cared for.